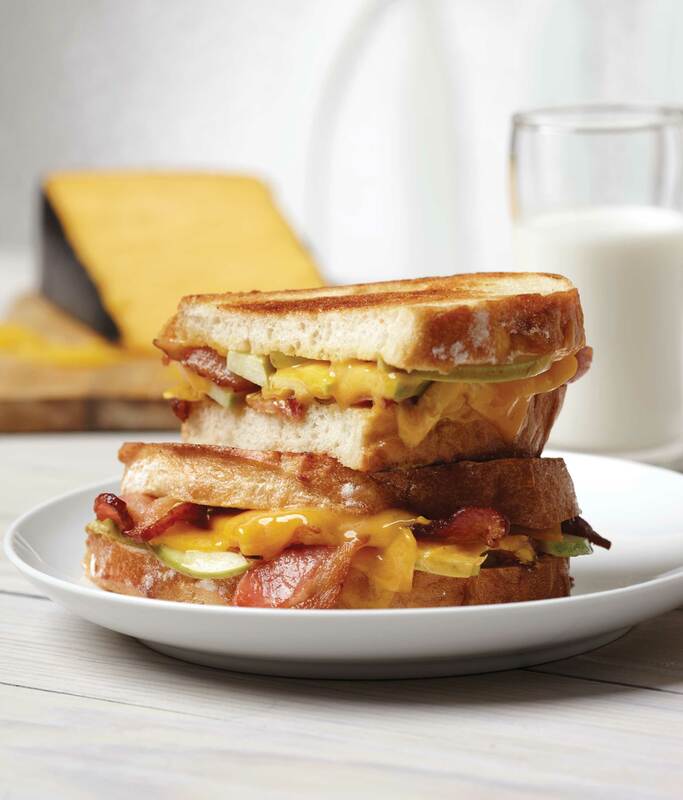 Gooey cheddar, crisp bacon and tangy green apples combine to create this grilled cheesy goodness. For a tasty twist, try these combinations: pear, ham and ricotta; caramelized onions and Swiss; raspberry jam and cream cheese; or pesto, ham and mozzarella. 1. Heat griddle or large skillet over medium-low heat. Or, you can use your panini press if you have one. 2. Assemble sandwich: Generously spread Dijon on 4 slices of bread. Top with slices of Cheddar, 3 pieces of bacon, apple slices and additional Cheddar. Place the remaining bread on top and spread with butter. 3. Place on skillet buttered-side down and butter the remaining side. Cook until cheese is slightly melted and bread is browned. Flip the sandwich and continue to cook until cheese is thoroughly melted and sandwich is golden-brown. See more cheesy recipes here. Next PostGuess Who’s Coming to Dinner — Everyone!